Most of our customers have experienced an increase in tanning turnover of up to 20% as a direct result of using SolarTrack Solarium Software. Through its theft control system, each and every tanning session is logged and recorded in SolarTrack, making it impossible to steal sunbed time or cheat the system. SolarTrack software is a complete management solution, from stock-reordering to professional marketing, from detailed salon analysis to equipment servicing schedules, SolarTrack does it all. If you want to stay ahead of your competitors, you need to make your salon work at 100%. SolarTrack helps you to achieve this and more. 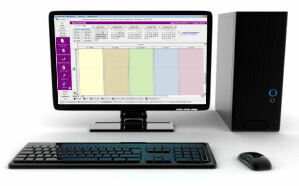 During busy periods, SolarTrack Solarium Software's unique queue manager helps you put the right person in the right room and the right time. Using its customer analysis functions, you can make sure your customers' favourite products are always in stock before they arrive. The advanced appointment book ensures you never double-book again. SolarTrack helps you remember customers' birthdays, handle queries efficiently and respond to the needs of your clients quickly. SolarTrack Solarium Management Software automatically warns your staff before they do something potentially dangerous. For instance, the system can be configured so that it only allows the appropriate sessions for a given skin type. Children under the age of 16 are flagged automatically by SolarTrack. We have already updated our customers’ software within Scotland and Wales so that it will flag up anyone under 18 now. Clients that have used the tanning equipment in the last 24 hours are shown on-screen before a purchase is made. The UK Tanning Market is more competitive today than it ever has been. New competition is opening up all around you. You need to stay in touch with your clients if you want to stay one step ahead of your competitors. SolarTrack has outstanding marketing tools to help you stay focused on your customer base, reward your loyal clients and win back your lost clients. At the end of every day, SolarTrack Solarium Software produces an automatic report detailed the day's transactions. This report can be emailed or faxed to three locations each night so that you can keep in touch with your shops without having to be there. SolarTrack can automatically reorder stock from your suppliers for you via fax or e-mail too, giving you more time with your clients. Have a look at the main features of SolarTrack Solarium Management software to find out more ways of how our software could benefit your salon.